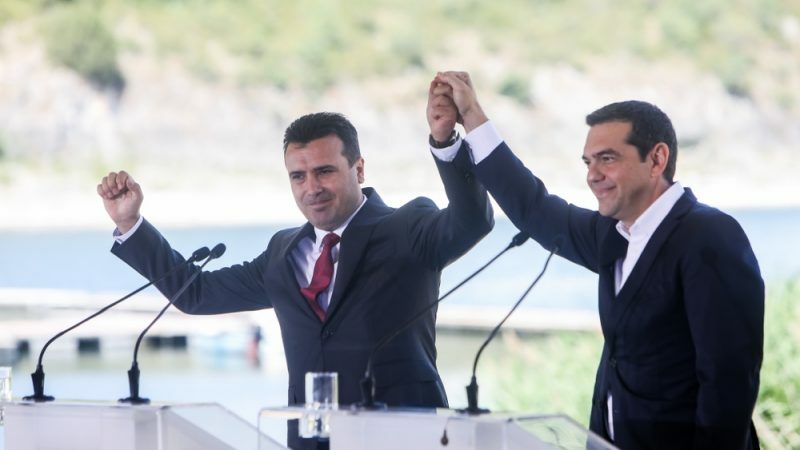 With the North Macedonia name change deal recently reached between Athens and Skopje, Greek Prime Minister Alexis Tsipras has achieved more than improving his international image, by putting pressure on his domestic opponents, writes Nikolaos Koutsimpogiorgos. Nikolaos Koutsimpogiorgos is a PhD Candidate in Utrecht University. The withdrawal from the Greek government of the junior coalition partner, the conservative Independent Greeks (ANEL), has resulted in what it seems like a major crisis for the leftist Syriza-led government of Alexis Tsipras. It’s the first of its kind as since he took power back in 2015. Tsipras narrowly survived a vote of no confidence in the parliament with 151 votes out of 300. The official pretext for the split is the ratification by the Greek Parliament of the “Prespa Agreement” with the government of the former Yugoslav Republic of Macedonia (FYROM) regarding the name change of the small Balkan country and the end of a dispute which has blocked FYROM’ integration into NATO and the EU for more than 15 years. ANEL and their leader Panos Kammenos – who created the party after breaking off from the conservative New Democracy (ND) and subsequently shaped its nationalistic character – oppose the Agreement despite they helped negotiate and sign it in the first place. This profound contradiction did not escape many politicians and analysts in Greece who accused Tsipras and Kammenos of staging a “divorce” to consolidate their electoral bases for next elections, whether they take place in September as planned or earlier in May (simultaneously with those for the European Parliament). The outcome has led to an unprecedented situation in modern Greek politics, where the government received the support of MPs from different parties, despite the opposition’s staunch objection to the Agreement. A successful vote of no confidence would have implied the death of the Agreement, and which is why rebel MPs broke party loyalty to support the government. Following a bitter dispute in the early 90’s between Greece and the then newly proclaimed FYROM regarding its name and national identity, the Prespa Agreement is the first serious breakthrough in 20 years. Primarily an inspiration of the former Minister of Foreign Affairs, Nikos Kotzias, a man with a long academic and diplomatic record and staunch advocate of what he called “a proactive Greek foreign policy”, the Agreement served more than one purposes for Tsipras. The first was to improve Tsipras’ image abroad as a responsible statesman, who brings stability in the volatile Balkan region and who, for that reason, should be internationally supported. As one of the main outcomes of the Agreement will be FYROM’s possible integration into the EU and NATO, Tsipras can now claim having shifted from an irresponsible troublemaker to a responsible peacemaker. The recent visit of the German Chancellor Merkel in Athens, who congratulated him for achieving this agreement, is a clear manifestation of the success of this strategy. The second aim was to divide the opposition in Greece, as he was aware that center-right New Democracy would be pressured by its European counterparts to vote in favor of the Agreement against the wish of its electoral base. The European People’s Party (EPP) has taken a clear stance in favor of the deal, but its leaders- except Bulgaria’s Boyko Borissov- have refrained from publicly criticising New Democracy for opposing the deal, as they do not want to be seen siding with Tsipras against their ideological partner. For the Greek centre-left, which at the time that the Agreement was signed was trying to preserve a fragile electoral coalition, the result was a deep division. The Pan-Hellenic Socialist Movement (Pasok) and Potami (the two main parties) broke ties, plummeting prospects for a united centre-left block. His third aim was to allow his coalition partner Kammenos to maintain some of its right-wing electoral base by splitting away just in time before elections. Since he resigned, Kammenos has been lashing out against the Agreement to rebuild his rightist image. After surviving the confidence vote Tsipras will set forward the official ratification process for the Agreement in the parliament. Considering that some opposition rebel MPs who voted in favor of the Government did so with the explicit purpose of voting in favor of the Agreement later, it is fair to assume that the ratification will go through. Greece is clearly getting in a pre-election period and all parties are getting in campaign mode. New Democracy leads the polls although numbers indicate that it will not be able to form a majority government. But the government questions the polls’ reliability, saying that none of them were accurate in the previous elections and the much-discussed 2015 referendum. Tsipras wants to narrow that gap and continue leading Syriza from the opposition, possible with the aim of one day ascending again to power, as part of a new two-party system where Syriza will have officially dominated the “progressive” center-left camp in the country. Regardless of the outcome, Tsipras has skillfully played his opponents by constantly setting the political agenda and successfully implementing a strategy of “divide and conquer”. He saved his party from obliteration despite all indications suggesting he would fail. His loss in the next election is all but certain, but with him being only 44 years of age it is unlikely that he will leave the stage any time soon.